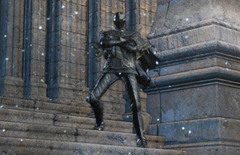 Known as a "cold-blooded hangman", now hollow, Vilhelm was a knight who served the three sisters who founded the Sable Church and was particularly loyal to the eldest, Elfriede. Though he was loyal to his mistress, she bestowed a sword upon him as a farewell gift, which he accepted as a sign of resignation from her service. No bell tolls, and yet, you've slipped into the painting? If you've lost your way, the words of Lady Friede will guide you. Now, go on inside. Show respect, and listen carefully. What's keeping you? Go on, right inside. Show respect, and let Lady Friede speak to you. Such is the conceit of the self-proclaimed seeker of truth. But in the end, you lack the stomach. 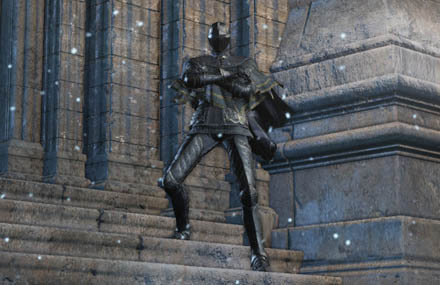 The black [armor] of Vilhelm, Knight of Londor, and a nice fit for any lean Hollow. Elfriede, the eldest amongst her sisters and leader of the Sable Church, bestowed this sword to her knight. Only, the sword was a farewell gift, and acceptance signified the knight's resignation from Elfriede's service. The key to the contraption leading to the attic of the archive found on the edge of the Corvian settlement. After Sir Vilhelm led a white-haird woman to the attic of the library, he kept this key as if it were his life.